Six on Saturday is hosted by The Propagator blog and here are my six this week. Lovely warm day here so getting this out quickly. I don't know what these are, they are supposed to be 'February gold' but those are all yellow. So they could be 'February silver' which might be the easy mistake to make, but since they are so late flowering they could be just something else entirely. 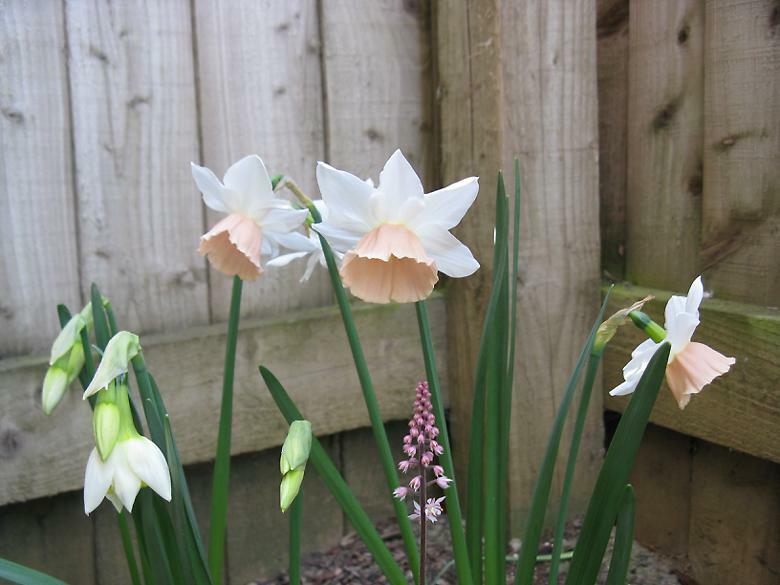 The trumpets are a pale yellow when they first open and they later darken to a creamy orange. Some of the stems have two flowers although most are single. I like them so am not complaining, and in fact I was somewhat wishing that I had picked another kind. They early flowering was the main attraction. All three of these are now out. Possibly my favorite. Today it reached 17C which is the warmest day this year, tomorrow is likely to be warmer still. I started wonerdering how many warmest days there will be this year. So far there have been 9: on the 4 Jan 2019, 6 Jan 2019, 7 Jan 2019, 15 Feb 2019, 21 Feb 2019, 22 Feb 2019, 20 Mar 2019, 21 Mar 2019 and today. There are several of the second set of daffodils now out. These are supposed to be N. 'February gold', but they are clearly not. 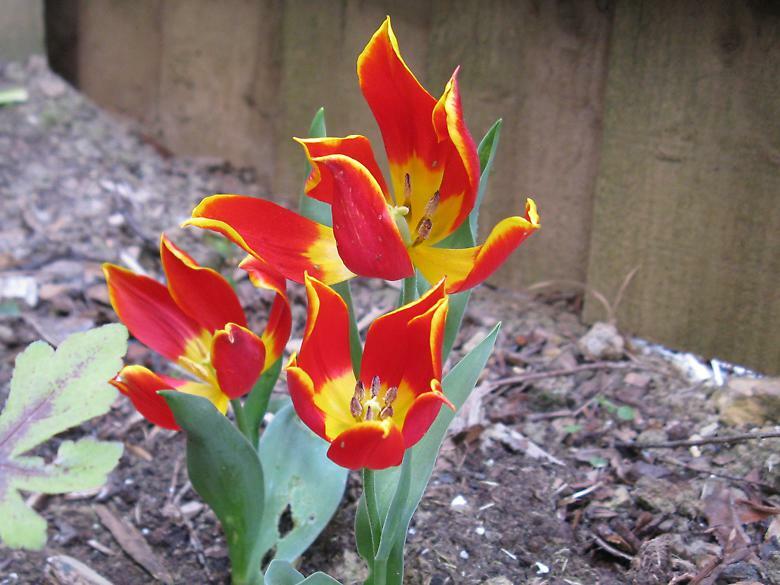 When these first open they have a lemony yellow center, which then turns to a creamy orange. There are also a case where a single stem has two flowers, although they are mostly single. 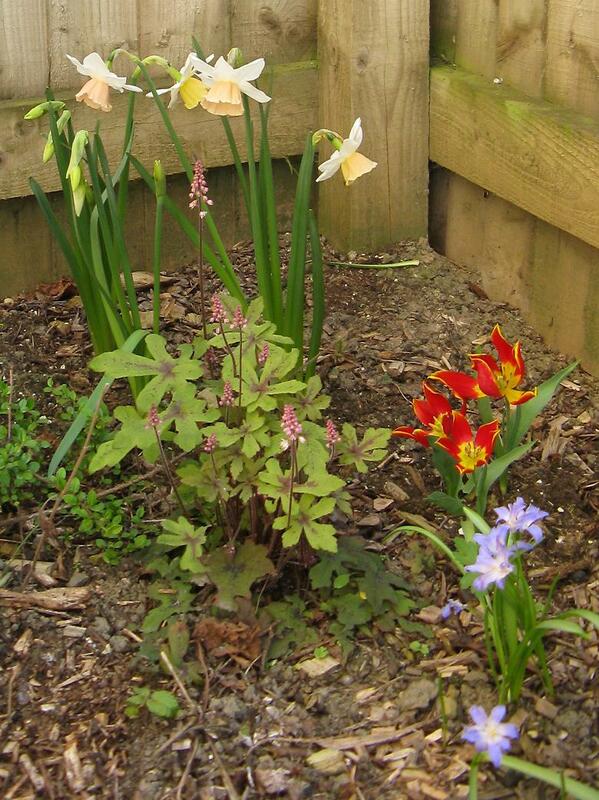 The photo also shows all three of the Tulipa schrenkii and one of my Tiarella 'Spring symphony'. Originally there was some Lonicera hedging in the shape of a cube. I cut it right back to a line of shrubs at the front of the right border. I've always been meaning to remove this and transfer it somewhere else, probably to replace the Laurel in the front garden. I finally dug it up today, it is in temporary accommodation at the moment and will be moved once I've cut down more of the laurel. The Geum 'Totally tangerine' was too near the path and it is also overshadowing the Nerines, so I chopped it up and moved it further back. The other pieces have been planted in different places to see how they do. They can be removed if the space is needed. 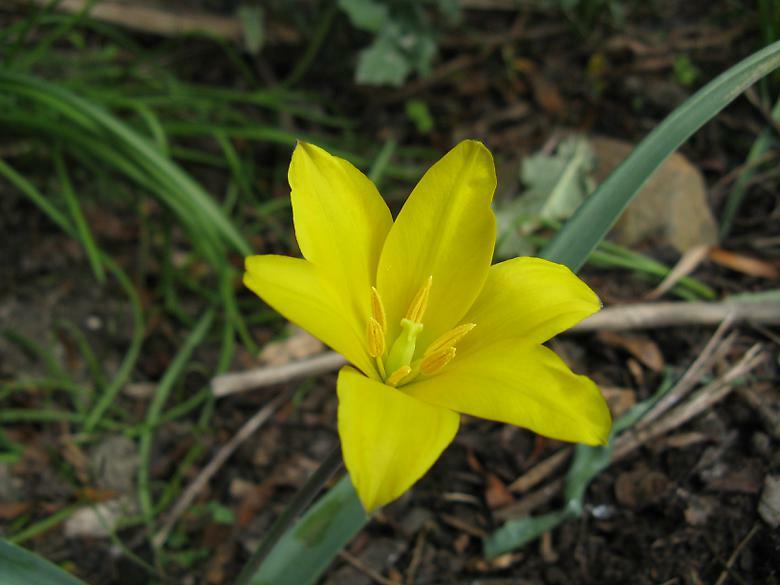 The first Tulipa kolpakowskiana flower opened today. 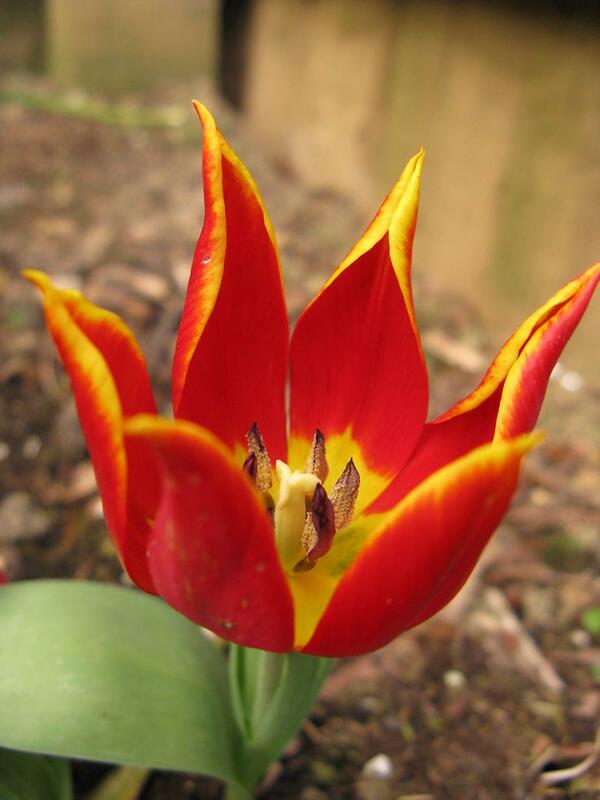 The leaves are very narrow on this tulip and the flower is smaller than the Tulipa schrenkii and flatter when open. 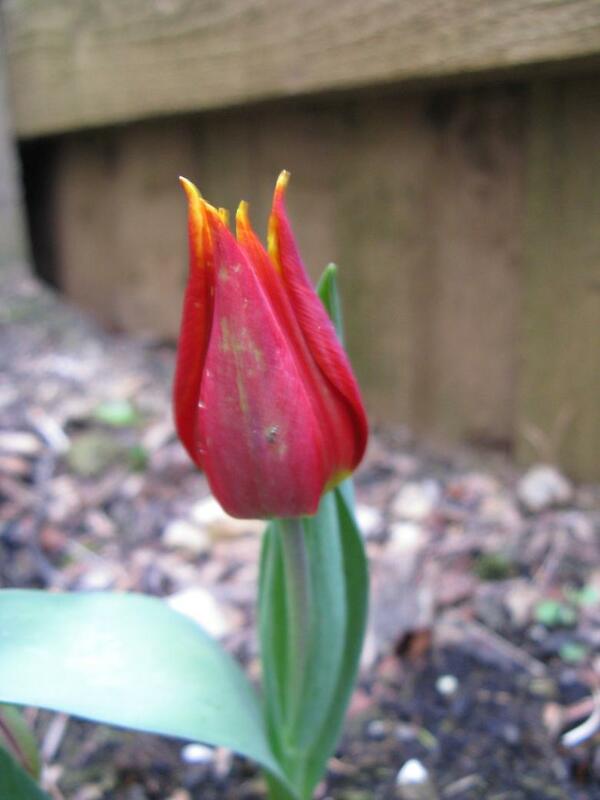 The first Tulipa schrenkii flower fully opened today. Snow this Wednesday morning, it melted by the afternoon, but had flattened a few plants which have mostly recovered now. The temperature dipped below zero on Monday morning but it was still above zero when it was snowing. 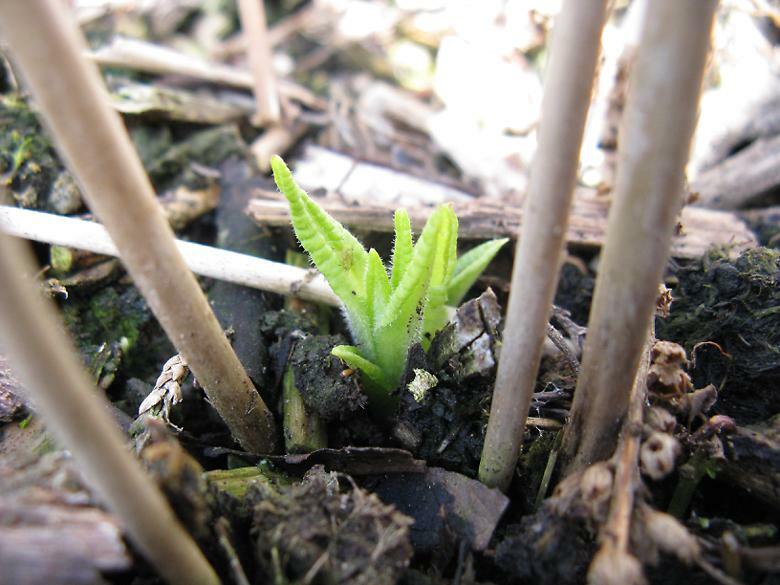 This weeks Six on Saturday as hosted at The Propagator blog. I thought that I had lost most of this, but as well as this there are also a few flowers in among the Puschkinia. 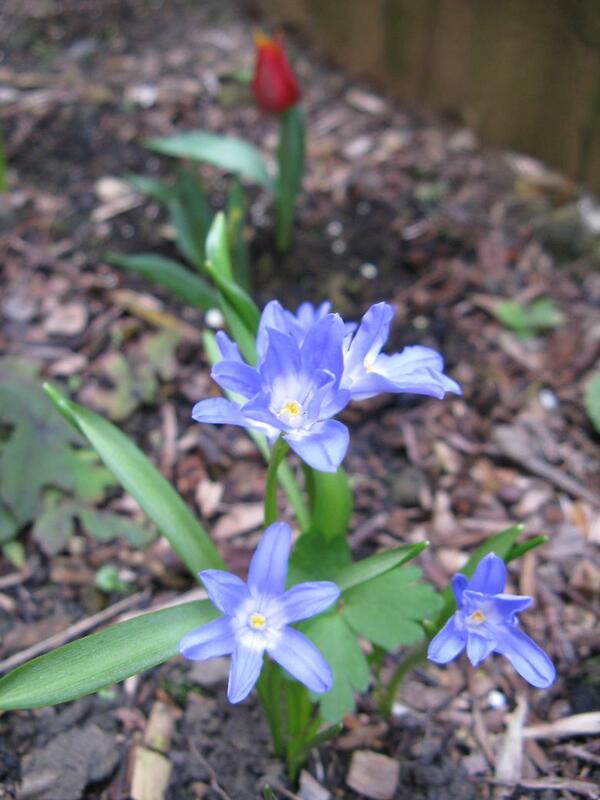 I was given a few more bulbs which I have planted in other places around the garden. There are three of these which I am looking forward to seeing all out together. You can compare with last years round up if you wish. It is interesting to note that the Pieris already had its red shoots in March in 2017, but not this year or last. In most other respects this year is similar to 2017. March was a reasonably warm month with only one day when the temperature dropped below freezing. The highest temperature of the year so far of 16C occurred on the 21st. I know that some places further south had higher temperatures than that in February, but not here - the temperature never reached 15C in Feb. 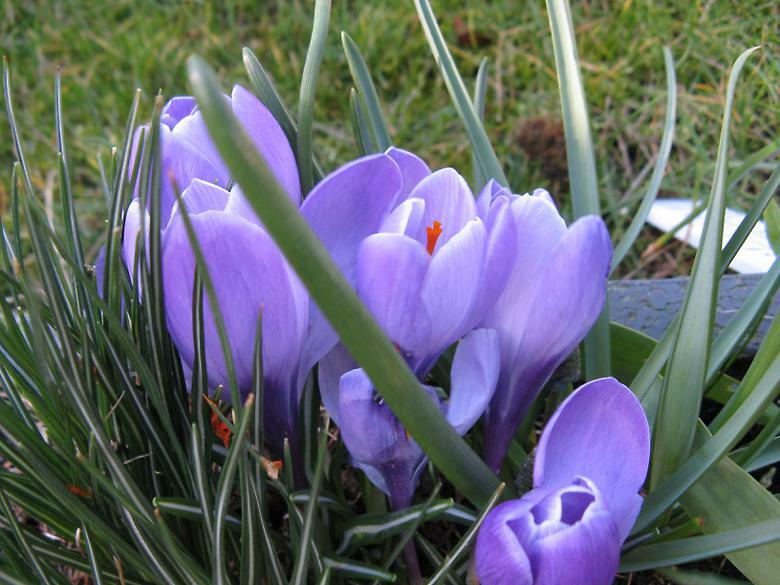 There were still some crocuses flowering, although they were all finished by the end of the month. 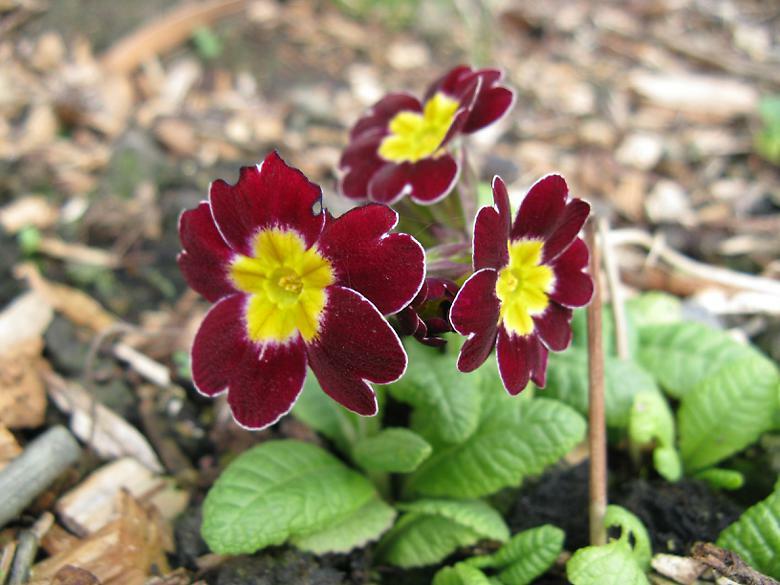 The primroses were flowering. Here is the one that suffered a vine weevil attack. It was great to see it recover from nothing to begin flowering again.